Thinking of combining rifle and pistol powder in a blended duplex load? Well think again. If you want to keep all your fingers, stick with factory powders and established loads at safe pressures. Here’s what can happen with a duplex load composed of both rifle and pistol powders. This catastrophic kaboom of an AR rifle took place at the Phoenix (AZ) Rod & Gun Club (PRGC) range. The photos, first posted on the ArizonaShooting.com forum, show how the AR blew up, ruining the bolt carrier, splitting the upper receiver, blowing out the Cavalry Arms polymer lower, and actually detaching the barrel. Suspected Cause? “It was a combination of rifle and pistol powder. The rest of the batch was pulled and there were apparently 3-4 other rounds with mixed loads.” It has been reported that these were commercial .223 Rem reloads. Parts Ruined: Upper receiver, Cav Arms MK2 polymer lower receiver, Bolt Carrier Group (total loss), forearm, barrel, gas tube, gas block, muzzle brake, mag release, bolt release, custom trigger and take-down pins. Also charging handle is bent and trigger group sustained some damage. Share the post "Duplex Powder Loading Causes Catastrophic AR15 Kaboom"
We are sad to announce the passing, on April 11, of Master Gunsmith and cartridge designer Ferris Pindell. 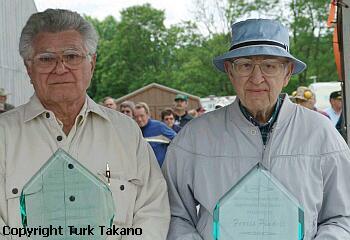 Co-inventer of the 6 PPC cartridge with Louis Palmisano, Pindell was a legendary figure in the benchrest community. A member of the Benchrest Hall of Fame, Pindell was revered as a great machininist and a true pioneer in the pursuit of ultimate rifle accuracy. The short, fat PPC cartridge he helped design has proven to be the most accurate cartridge ever created. For decades it has dominated the sport of Benchrest for group and the PPC holds virtually all the major 100- to 300-yard group accuracy records. Just to let everyone know that Lou is in extremely poor health. I know it would mean a lot to him to hear from shooters. He loved shooting and shooters more than anything throughout his lifetime. Please…just [send] a card or note… or even a call in the afternoon. He is 80 now and very frail… asking you to please reach out to him at this difficult time. CLICK HERE for Lou Palmisano address. Share the post "Shooting Community Mourns Passing of Ferris Pindell"